Bask in the sunshine, on this island paradise in the West Indies. Stretch out in one of the hotel's 196 spacious guest rooms and suites or exclusive villa accommodations. Frolic on the golden beaches of Nevis or find tranquility in the Resort's award-winning spa. Play golf while taking in dramatic island views of one of the world's most scenic courses. 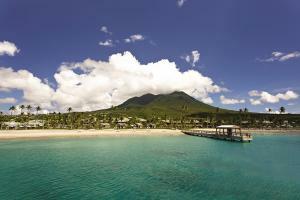 The island is yours to explore at Four Seasons Resort Nevis. The oceanfront restaurant features fresh seafood and spectacular sunset views. 10 minutes from the Nevis International Airport, 25 minute boat ride from the St. Kitt's International Airport. Botanical Garden, Brimstone Hill Fortress, Courthouse and Public Library, Cultural Complex, Indian Castle Race Track, Montpelier House, Nisbet Plantation.